ButtonGwinnett is a Legacy Library. Legacy libraries are the personal libraries of famous readers, entered by LibraryThing members from the Legacy Libraries group. » Button Gwinnett's legacy profile. ButtonGwinnett is also an author. 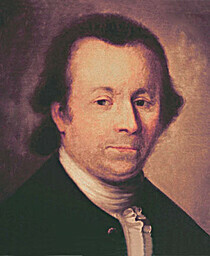 About meButton Gwinnett (1735 - 19 May 1777), Georgia merchant, statesman and Signer of the Declaration of Independence. Born in Gloucestershire, England, Gwinnett was educated at The King's School, Gloucester, before beginning a career as a merchant. Gwinnett and his wife, Ann Bourne, emigrated to South Carolina in 1762, again taking up mercantile pursuits, and moved to Georgia in 1765. Gwinnett purchased land on St. Catherine's Island and began a plantation. He was elected to the House of Assembly in 1769, but withdrew from politics by 1773 due to financial difficulties. Gwinnett was named a delegate to the Second Continental Congress in 1776 and signed the Declaration of Independence. He left the Congress in the late summer of 1776 and returned to Georgia, where he was a member of the state constitutional convention in February 1777 and served as acting President and Commander in Chief of Georgia from in February-March 1777. He ordered a failed campaign of East Florida, and failed to win election as Governor in May 1777. Although Gwinnett was cleared of wrongdoing relating to the failed expedition, a subordinate officer, Lachlan McIntosh, denounced him, and Gwinnett in turn challenged McIntosh to a duel. The two met on 16 May 1777, and while each shot the other, Gwinnett's leg wound proved fatal and he died three days later. Gwinnett's signature is among the most-sought by collectors, because so few examples of it exist. About my libraryGwinnett's small library is as documented in an inventory of his estate taken soon after his death, and printed in Charles Francis Jenkins, Button Gwinnett: Signer of the Declaration of Independence (Doubleday, Page & Co., 1926), p. 174.